Leading e-magazine for the contemporary Bulgarian woman. It aims the women as a women, mothers and wives. The site gives valuable information and useful advices for every single aspect from the everyday life of the women in active age, connected with their home and family, health, fashion and beauty trends, pregnancy, upbringing of children. To facilitate women in their constant care for the family table, the site offers rubric “Cookery” with wide variety of recipes. The e-magazine is online since March 2002 and for these 10 years has established itself as a leader among the serious female online audience in the country. 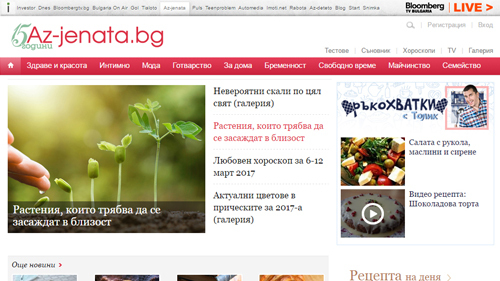 Az-jenata.bg has its own forum and female blogosphere.